Spring is finally here and although there is not too much on offer, the series starting this Spring will surely entertain everyone. Many fans and I have been waiting for this series to get animated since reading the first chapter in 2014. When Bones studio was announced to animate the series, fans were overjoyed. 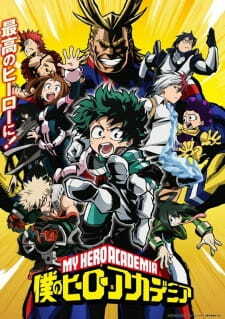 Izuku Midoriya is a regular middle school student in a world where people with superpowers known as "Quirks" are the norm. However, he dreams of one day becoming a Hero, despite being bullied by his classmates for not having a Quirk. After being the only one to try and save his childhood bully, Katsuki, from a Villain, All Might, the world's greatest Hero, bestows upon him his own quirk, "One For All". The story follows Izuku's entrance into U.A. High School, a school that cultivates the next generation of Heroes. Season 2 of this supernatural comedy series. "Volume 29 (22-6-2009)" should be "Volume 29 (29-6-2009)"